I recently discovered the Audrey & Me brand of baby & toddler clothing and accessories. I love supporting Australian companies, and Audrey & Me has quickly become on of my favourite brands. Their items are all handmade (a rarity these days!) in limited fabric runs and are made from 100% natural fibres. These gift boxes also come in boy and girl designs and there are some other lovely styles to choose from too (one even comes with a bottle of Moet champagne – yes please!). If you know a new mum or are heading to a baby shower anytime soon, you can’t go past this beautiful gift collection. The bandana bibs are just too cute for words! If you’re looking for beautiful hand made baby & toddler clothing items, I encourage you to visit the Audrey & Me website, or check out their Facebook and Instagram pages. Along with gift boxes they also stock beautiful custom made pram liners, play mats, nursing covers and lots more. 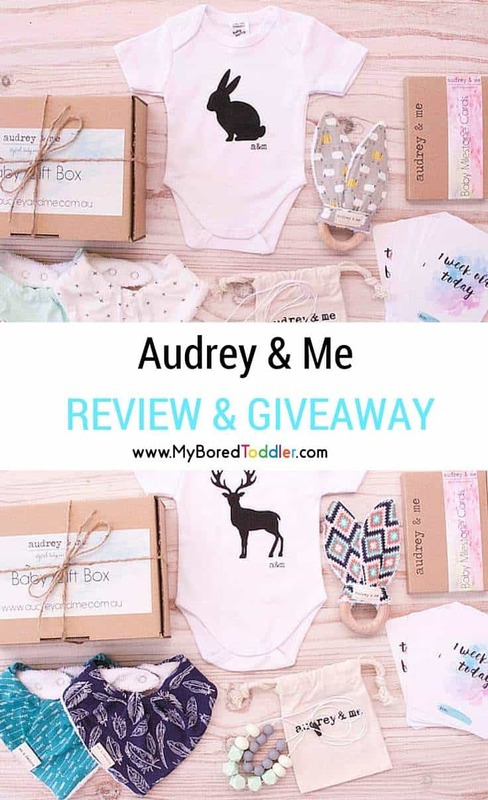 The lovely people at Audrey & Me have kindly offered to giveaway a new baby gift box to one lucky reader valued at $89.95. To enter visit their website and tell us in 25 words or less which item from the Audrey & Me collection is your favourite. Filed Under: Toddler Fashion, Toddler Reviews, Win! « Toddler Busy Bags – Magnet Board Fun! I have a babyshower coming up for a lovely friend and this would be a wonderful gift for her. I love the teething rings, the Royal Guard is just adorable. I’ve never seen a pattern of the royal guard…just precious! I’m in love with the white suit with the black bunny it’s just adorable. The Manhattan Purple Teething Necklace is just gorgeous and on my wish list. Slouch Beanie-Grey Stag is so cute! I LOVE the Baby milestone cards, snap a photo with them and you can have an amazing keepsake and memory! The Blue Feather play mat looks great. I’ll lay my grandchildren on that any time of the day! The much needed milestone cards for those weekly snapshots of how much our babies grow in such a short time! Teething necklace because my girl always like to hold it in her hands and love the beautiful colors too. The Blue feather play mat is such a great item, I wish I had a padded mat for my first born I learn my lesson second time around and made my own but nothing compared to the great design and finish on your mats. Love the Blue Feather playmat, unisex, soft and very practical! A great gift idea! I would love to win the baby boy gift box. Good luck everyone!!! I love the Play Mat – Blue Feather. Gorgeous AND practical, this would make a lovely gift for any expectant parent. I love the rabbit onesie – so cute! The pram liner ‘Pink Gold Brushstrokes’ is simply gorgeous! So beautiful and delicate – I have to have it! The grey elephant playmate is so cute, my little man would love it. The milestone cards are gorgeous, and they make it so much easier looking back on those early months to see how quickly bubs grew. I just love the bandana bibs. They are so practical, and cute too. Perfect for newborns that dribble when they drink or when teething happens. Adore the village playmat as it’s so practical, and so convenient to take with you on any outing or trips away. Love your site and love all your creations. I love all the playmats – they are a great size, look colourful yet stylish, and are a must when visiting relatives or friends! Would suit boy or girl beaut. The Coral Pink Elephant playmat is perfect anywhere. I would’ve loved to receive one of these! This will be a perfect gift for an new mummies I know from now on. The Fox in Woods play mat is absolutely gorgeous! I’m currently expecting our first baby and keeping the gender a surprise, so I love that the colours are so neutral! Also, the tied-up-corners feature is very nifty! Fox in Woods play mat. Currently expecting our first baby and adore that the colours are neutral! Also, the corner-tying feature is very nifty! * Edited to be 25 words!